Not only does exercise help you get rid of those annoying love handles and melt away your muffin top, it can do loads of good to you in so many other ways. 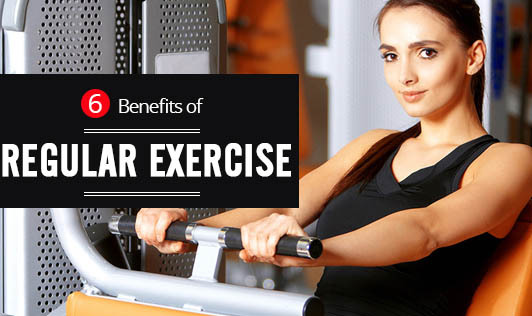 Here are some of the lesser-known benefits of exercise. Exercise cuts diabetes risk in obese people. Scientists found that people with large waistlines who exercise regularly were less likely to suffer from type2 diabetes than their less active counterparts. They found that physically inactive people with large waistlines had a 5.5 times greater risk of suffering from diabetes than active people with small waists. They added that 30 minutes of exercise, five times a week could help people with large waists lower their odds of suffering the illness by 4.2 times. Exercise enhances work performance. A research study has found that busy professionals who exercise during the day feel more productive. Spending about 30 to 60 minutes on any exercise ranging from yoga and aerobics to strength training made a lot of difference. It helped one to deal better with the demands and pressures on the job. Management skills, mental performance, and ability to meet deadlines improved on days when one exercised. Furthermore, it improved mood and eased stress to a very large extent. Exercise must mean exertion, if good health is what you are looking for. If you want to get any health benefit from exercise you have to push yourself, according to a study published in a journal on heart health. For good health you should aim for 30 minutes moderate exercise five days per week or vigorous exercise three days a week. Brisk walking is considered as moderate exercise while running/jogging is considered as vigorous. The authors believe that people should include both vigorous and moderate exercise, combined with some weight training each week, for example, a mixture of jogging, fast walking, and strength exercises. Exercise improves bone health. Exercise not only improves bone health, but it increases muscle strength, coordination, balance, and leads to better overall health. Like muscle, bone is a living tissue that responds to exercise by becoming stronger. Young women and men who exercise regularly generally achieve greater peak bone mass (maximum bone density and strength) than those who do not. Women and men who are 35 and older can slow bone loss with regular exercise. The best exercise for your bones is weight-bearing exercises that force you to work against gravity, such as walking, hiking, jogging, climbing stairs, tennis, and dancing. Regular exercise helps prevent arthritis. Regular exercise can play a vital role in the prevention and treatment of all forms of arthritis. The use of weights builds denser bones and strengthens the muscles, ligaments, and tendons associated with joints. Research indicates that even yoga generates beneficial mechanical pressures on joints. Hence, some form of mild exercises such as cycling or walking, together with a well-balanced low-fat diet will help to prevent arthritis. Regular exercise reduces risk of blood clots. According to a study, regular involvement in sports reduces the risk of developing blood clots by 39% in women and 22% in men. Overall, figures for both sexes showed that participating in sports at least once per week, regardless of the type of sport or its intensity, reduced the risk of developing a blood clot in a lung artery by 46% and a blood clot occurring in a leg vein by 24%. The findings also showed that people who did not participate in sports were more than four times as likely to develop a blood clot if they were obese than lean. While exercise provides such a wide variety of benefits, getting a health check-up done and checking with your physician before you begin any form of exercise can prove helpful.